This new business card ended up very differently than how I imagined it would be when I started. First time users save $% at MOO.com with this referral link: https://refer.moo.com/s/tamdoll. Well, this wasn't going to work for me. First of all, my strands of red were showing from the back side and all the photo editing in the world wasn't going to make me happy with it. Also, knitting isn't the only thing I do... so this wasn't going to be a true representation for tamdoll.com. Now THIS made me happy! After some digital editing, I ended up with my new business cards. My goal was to keep these as simple and memorable as possible - since tamdoll.com is the hub for all my online content and I can be reached via comments or email at the site, I decided that was enough. And I'm hoping the various elements of my name tell a story about the different crafts I dabble in. I even left off my full name because, after years on the internet, a lot of friends simply call me "Tamdoll". MOO cards have a great feature where one side of your business cards can be an assortment of images - so I chose some pictures of dolls I'd made, photographs I'd taken, and drawings and collages that I've created. They arrived in the mail very quickly and I couldn't be happier with the quality and results. 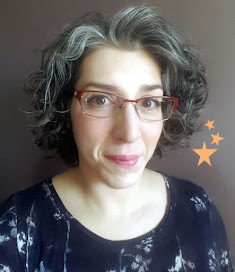 I definitely splurged on these, and that's giving me an incentive to keep blogging, sharing the creative things I'm working on so I have something to be proud of when someone comes to the site. 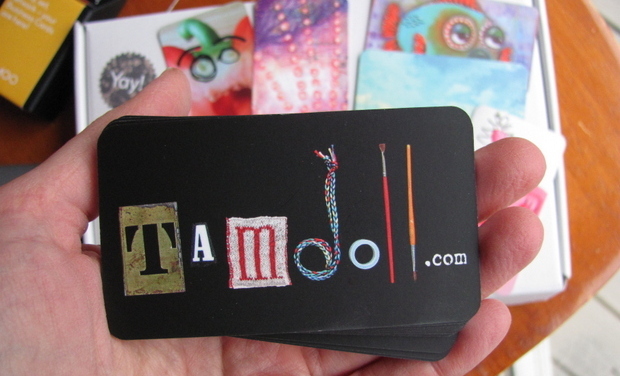 Thanks to Teesha Moore of the Artstronauts Club for the MOO card reminder, I'd used them years ago to create stickers and was happy to return as a customer. If you've never used MOO before, when you place your first order with this link: https://refer.moo.com/s/tamdoll, you'll get a $% off (and I'll get a credit for the referral). Sewists may also like my Business Card Holder Tutorial. How do you share your website or online business with the world? I love your new cards! What a fun, original idea and a memorable card! Thanks Edi! If this doesn't make me push myself to get the blog/crafting going again, nothing else will.